Introduction: Upswept petals and variegated leaves makes Cyclamen unusual but ravishing, almost like a bird in motion. Cyclamen is a type of perennial plant which grows from tubers. The tubers being the storage organ that helps the plants survive when they are dormant. Most of its species belong from Mediterranean region, from Spain to east of Iran. It is also located in southern Europe in northern region, north east of Africa and Somalia in south. In many of its native location, the number has decreased significantly due to collection from the wild; making many of its species endangered. Many of species are said to go extinct in the upcoming fifty years. One is bound to get bewitched with its vibrant coloured petals and beautifully printed leaves hence, its wide popularity as household flowering plant. We commonly know them as Persian Violet or Sow bread though they are from the myrsinaceae genus. They stand tall and proud above a 2-3 inches leaves on a stalk that may grow up to a foot. They mainly consist of five lobed petals bending backwards. Unlike many flowering plants it blooms in winter. Often referred to as “winter charmers”, these plants add colour to your gloomy winter gardens. History: The family name “cyclamen” is obtained from the Greek word kyklos, which means ‘circle’ pointing to the almost circular, disk-shaped tuber. They have been tracked way back to the period of ancient Greek. It is said that these plants were distributed by some wild species around Palestine to west Europe and then thoroughly distributed in France, England, Holland, Germany and so on. They were fairly popular in around 16th century when cultivated in the gardens of Queen Elizabeth the first of England. Their dormant nature in summer led to its disappearance but they came into fashion again in the 19th century when John Willmott discovered ways to shorten the flowering duration. The florist’s cyclamen was also widely renowned in Victorian houses and conservatories. A guy from Japan called Mr. Koju Ito originally began cultivating Cyclamen in Japan when a foreign lady recommended him to. The climate was not very suitable and it was tough so he used a method called “Flame” to adjust the temperature to grow the flowers using pot culture. This “flame” method became very popular and was used widely to cultivate Cyclamen in climatically unsuitable areas. Cyclamen libanoticum: It is found in a small region in Lebanon. These lovely flowers are very rare and difficult to grow though it’s becoming more and more common in cultivation. There is still uncertainty in whether it belongs to Cyclamen genus or not. Cyclamen intaminatum: It is found mainly in western Turkey. These tiny plants are mostly cultivated as a container plant. These white coloured beauties grow amazingly in cold temperament. Cyclamen trochopteranthum (alpinum): It is a species which belongs from south-western Turkey. It grows in rocky regions, woodlands, and scrub. The Flowers blossom during spring with a bright pinkish colour and twisted propelled shape petals. Cyclamen cilicium album: Plain white coloured flower around 3 inches tall with leaves in the shape of a heart which is very rare in nature. Over the years, it has been found only a few times in the wild. Cyclamen purpurascens: It belongs to rocky areas and mountain woods in The Alps. This evergreen flower gives off delighting smell. Cyclamen balearicum: These 3 inches tall species have heart shaped leaves which are almost silvery. It has pure white flowers which blossom during March/April. Cyclamen hederifolium: It is the most seen and cultivated species as it is very rewarding. These pink-coloured darlings should be planted a foot apart in shady areas. Cyclamen repandum ssp. peloponnesiacum: This species is natively from Greece. With pink flower and dotted leaves it looks strikingly beautiful. It is rare too. Cyclamen purpurascens ssp. ponticum: It is found in the solitary Caucasus Mountains with elliptical pinkish and twisted petals. Cyclamen cyprium: This species has enamouring scent with lovely white- red coloured flower. About 4 inches tall this plant flowers in September/October. Cyclamen cilicium: These lovely species are probably easiest to grow mostly in a dry area with plenty of sunlight .These are 3 inches tall. Cyclamen pseudibericum: These charmers belong from Turkey. They have vibrant purplish colour with beautifully carved leaves. Cyclamen graecum: It is a distinct species with large flowers in bright pink colour. It is around 4 inches tall with unique leaves each different from the other. Cyclamen repandum: This Species belongs to southern Europe. They have an almost triangular leaves. Cyclamen coum: These winter charmers are pink or crimson coloured. As the name suggests they flower during winter spreading slowly with almost carpet like texture. Cyclamen mirabile: Almost resembling to cyclamen cilicium this species is mostly found in hill and rocky areas of southwest Turkey. It is one of the most piquant and rare cyclamen. Cyclamen africanum: These species have large leaves which are of brighter green shade than the rest. Around 5 inches tall it flowers best under cold glass. Cyclamen rohlfsianum: It is the most delicate species of all with distinctive flowers. It is natively from Libya and flowers in autumn. Cyclamen persicum: This species is from eastern Mediterranean region. It is also known as Florists Cyclamen due to its wide popularity as household flowering plants. Cyclamen parviflorum: It grows in mountain woodlands. It is considered to be least attractive among the others. It is also very difficult to cultivate. 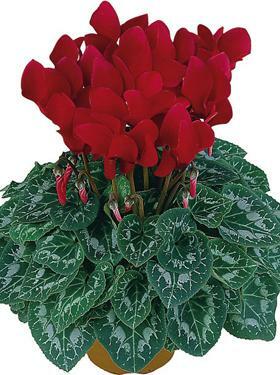 Cultivation: Cyclamen are wild plants which can be cultivated indoors as well. There are certain conditions required for their cultivation. Firstly, when buying this in a potted plant, look for one with buds about to open, instead of one in full bloom. Always look at the undersides of the leaves for healthy stem with buds. Be sure to inspect flowers, buds, and undersides of leaves for any indication of disease or insects. These plants grow from seed and flowering may start from anywhere between 9 to 18 months. Seeds need to be sown immediately after they are ripe. For good growing conditions the soil should consist of yellow loam, coarse grit (silver-sand) and leaf mould in equal proportions. In a slightly alkaline soil sow the corms 2inches deep and 4 inches apart. Cyclamen repandum needs to be planted 3 inches deep. Cyclamen needs to be covered with a thin layer of soil. When In a greenhouse or growing indoors care should be taken to protect them from direct sun, extreme cold and proper circulation of air. Never allow the soil to dry or get waterlogged. Cyclamen can be held over for pretty long time if care is provided to maintain right conditions. Some species of cyclamen especially Cyclamen hederifolium can be cultivated in mild climates. Some other can grow in rather frosty and cold climate. Cyclamen purpurascens, Cyclamen cilicium, Cyclamen coum can survive down to a temperature of -22 °C. Others, such as Cyclamen africanum, Cyclamen persicum, only bear minimum frost. Care : Just as with women all they need is bit of attention and they give rewarding results. One should keep in mind that they will not thrive in wet, windy and cold conditions. First and foremost care to be taken is to never water them generously such that they become waterlogged. This is one of the most common mistakes to be made by homemakers. If possible don’t water them from above to avoid water accumulation in the centre. Never allow the soil to dry, they crave a humid atmosphere. Keep them in a place with lots of light but no direct sun as they prefer cool temperament. Preferable temperature would be 60 º -72 º F during the day and 50 º -65 º F during the night. Also protection from strong winds is required for these sensitive creatures. Uses: Cyclamen is not just limited for decorative purposes but also as a significant medicinal plant. In ancient times powder of this plant was used to cure cancerous ulcers. It is also used as powerful cleansing agent to remove sinuses and blemishes from skin though huge amounts can be quite harmful. For its cleansing and dissolving purpose, cyclamen roots can serve as a medicine for problems of the uterus. It can help in digestion of the food as it activates digestive glands. In primitive herb books it is said to have been used as an element in vaginal medicament to bring on menstruation, to sanctify inflammation or a miscarriage. It was believed to have rushed the delivery for pregnant women, or cause premature birth. It was also believed that wearing its root could actually cause miscarriages. Its root can be useful for curing mucous accumulation, cough/cold, dropsy, nervous ailments, skin irritations such as ringworm, and turgidity. It is also served for decreasing rheumatic pains, joint problems. Its laster is useful for cataracts and gouty arthritis. It is also useful in case of sunburns. It is responsible for cyclamine, which acts as an antidote and ointment for poisonous snake bites. Natively from Mediterranean area it served as a strong fish poison which helped in fishing. Oils of Cyclamen are widely used in perfume enterprises due to their alluring aroma.